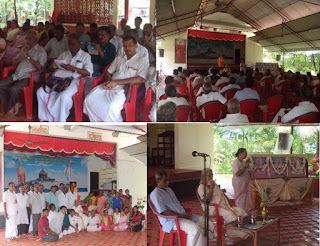 Vivekananda Kendra Dakshin Pranth Chowmasik Baithak was held on 19th and 20th August 2017 at Vivekananda Kendra Vedic Vision Foundation, Kodungallur. Apart from karyakartas of Kodungallur, there were 31 karyakartas who had come for the Baithak. 21 members were from Tamil Nadu, 7 from Karnataka and Mysore, and 3 from Thiruvananthapuram, Kerala. The baithak began with Bhajan Sandhya in the evening at 6.30pm. At 7.30 Su. Radha Didi welcomed all karyakartas and introduced Ma. Hanumantha Raoji, Ma.Lakshmi Didi and Ma.Sudhakarji. It was an informal session in which self-introduction of all the workers was followed by a sharing of experiences by the Ma. Didi and other elders. On the 20th, the morning sessions included report reading of the various branch and project centres. After lunch session was kept for planning for the next four months. Concluding session was from 3.30 p m to 4.15 p m. Ma.Didi blessed all the karyakartas with tokens of her affection. Almost all the karyakartas left by 20th night.